This 16" chess set, also of original teak, is particularly suited for play outdoors. The playing surface for this chess set is a flat board of 8" x 8" squares. All ages can play on this set, of course, but children will be especially delighted to play with it in yard, garden, or even play room, and it is still light enough to be transported wherever one might wish to take it. This Chess set is called color chess set. In the picture above, you can see about its different color with ordinary chess set that commonly use in champion or in any chess game event. The ordinary chess set is brown and black, supported with its chess board. But to increase the interesting feeling of chess in kids world, we try to make some different chess pieces. 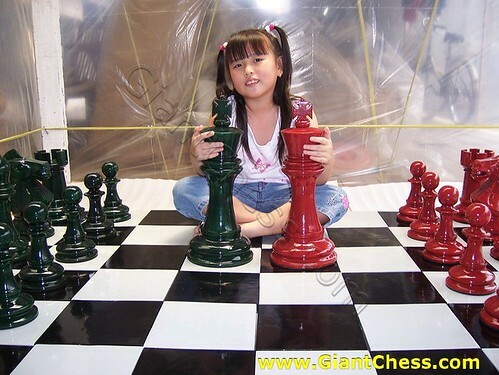 The red and dark green chess set will attract you to play outdoor with your friend or family. Just try it now!